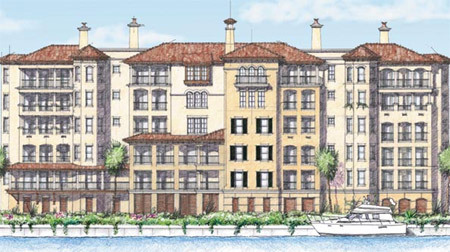 The Cove at St. Johns condominiums in Jacksonville, Florida. Get Feng Shui tips, Jacksonville Florida real estate listing, home for sale, pre-construction and relocation information from Will Vasana, REALTOR®. Request your FREE relocation package. I can help with your new home search anywhere in the country. "Buyers average a 5% savings when represented by a Buyers agent"
The Cove at St. Johns is a luxury condominium community featuring 76 upscale condominium residences along the north shoreline of Goodby's Lake. Conveniently located on Baymeadows Rd. near the Avenues Mall, I-95 and great dining, The Cove at St. Johns is just minutes from the Beaches and downtown. Residents enjoy spacious floorplans from 2,500 to 3,00 square feet with an Epping Forest Yacht Club membership and access to a dock with 13 boat slips. Update: The project is put on hold. Developer Devlin Group did not comment on when or if they will complete the construction. I make it my business to be aware of every local Jacksonville home or property on the market. I even know of properties that will be available, but have yet to formally be placed on the market. I have direct access to the MLS (Multiple Listings Service), and also to every other agents in the Jacksonville area and all of their listings. Let me help you. Give me some idea of what you are looking for and I will personally review all my sources of real estate listing information and send you everything within your price range that matches your criteria. I can save you a great deal of time.